Travel from the parking lot along the shuttle bus route to the life-sized Noah's Ark. 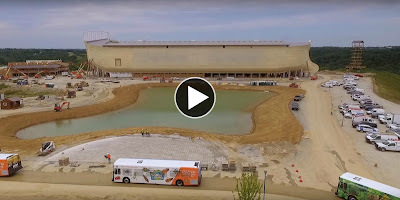 Plus, take a look at the zip lines, restaurant and Ararat Ridge Zoo, while flying around the Ark as preparations are being made for the July 7, 2016 opening. A new entertainment park featuring a gigantic wooden boat designed to be a “life-sized” replica of the ship the Biblical spiritual leader Noah built to save his family and other land-dwelling animals from a worldwide flood that killed everything else on earth is set to open this week in Kentucky.